Yesterday, the whole market crushed the investors’ sentiments as all the coins were dragged down by the bear once again. However, the coins have successfully dodged the bear’s attack, with some of the coins glowing double digits. Tron [TRX], a well-known altcoin in the market, has surpassed Monero [XMR] in terms of market cap once again. The cryptocurrency is now placed in the eleventh position, with the privacy coin pushed down to the twelfth position. Notably, Tron was also one of the biggest gainers during the bull’s last visit. Additionally, Tron is not the only coin to rally in the market. Majority of the top coins such as Bitcoin [BTC], Ethereum [ETH], Litecoin [LTC] and Stellar [XLM] have joined the bull run as well. 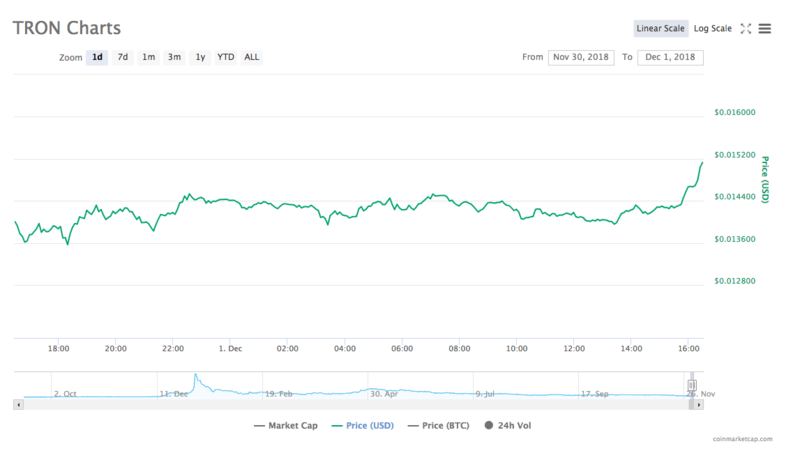 According to CoinMarketCap, at press time, Tron is trading at $0.015 with a market cap of $996.72 million. The coin has a trading volume of $88.52 million and has surged by over 6% in the past 1 hour. The highest trading volume for the coin is pouring in from BitForex with TRX/USDT pairs. The second highest trading volume is recorded on Binance with Tether pairs. Other major exchanges contributing to this significant price movement are Upbit, OKEx, and Huobi. Moreover, Tron is known in the market for its promising claim of surpassing Ethereum [ETH], the biggest smart contract platform and now, the third biggest cryptocurrency by market cap. The platform even acquired BitTorrent, the biggest Torrent platform with an aim to Decentralized the Web. At present, BitTorrent is a part of Project Atlas, which will be introduced to the investors and enthusiasts in Q1 of 2019. Additionally, Tron recently announced a $100 million fund for game developers called Tron Arcade. This initiative will support developers and projects for the next three years. The main aim of the Foundation in investing in gaming industry is to encourage developers to build on top of Tron. The Foundation also claimed that they will not be restricting Tron to the gaming industry alone but will also venture into other industries. This includes social media, charity, entertainment, enterprise solutions, and consumer internet. The post Tron [TRX] closes in on Monero [XMR] with 6% hike in one hour appeared first on AMBCrypto.